Second match in about 3.5 years. Seeing myself on video was very eye-opening, I have a LOT of work ahead but my goal remains the same! My last match was about 2.5 months ago around my highest weight (188 lbs), vs. this same opponent and I got crushed 6-4 6-1, completely gassed. This match I actually started feeling tired after 2 games, I think it was nerves because I'm actually camera-shy (despite my profession). Oh, and feel free to critique/criticize away, the more the better for me! 1 more edit: golfer’s elbow is now completely healed, I can now work on the hitches in my serve motion. Just curious, how did you find your opponent? Silver lining: you’re at least half-way to 6.0, maybe even 2/3. Keep at it! That’s looking at the glass half-full! Have you ever had any coaching on your serve? A slice serve, rather than kicker, is a good primary serve for a little guy because a kicker won’t kick as high as with a taller player (and be more attackable) while the slice serve will naturally stay lower than it does for a taller player (and be less attackable). Especially since OP is a lefty, that slice serve would be the main weapon I'd be working on. Yeah I’ve had about 5-7 private lessons, a couple early in my tennis career and the coach taught me grips, the rest when I worked at a club and was in my early 20s and each session we worked on my serve about 20 min a lesson. I never played baseball and I’m not a natural thrower, I can’t even throw a tennis ball baseline to baseline. When I really just focus hitting hard I can (but with terrible form), had my serve clocked at the citi open 105 mph this year and a few years ago clocked at 97 mph. I agree, I’m not even thinking about a kick serve right now, I just want to develop decent form firstly, then a consistent + non-attackable serve slice and/or slice topspin. You're not really engaging your entire kinetic chain on your serve. For starters, your tossing arm falls well below vertical before starting your service motion. Secondly, your feet don't even leave the ground during your serve (you aren't engaging your legs/hips). Good observations, 100% agree. I was so unconfident serving that I was basically arming slow serves in. I’m going out tomorrow to hit about 60 serves I’ll record a few and work on the above and a couple of other things too. I think a topspin slice would be better. Gives him more net clearance than a pure slice. Being a lefty is a big advantage for serving, though, if he can develop a good slice / topspin-slice serve. For the forehand, you are hitting a lot of open stance but moving backward as you hit. Many of the balls are then too soft and don't get over the net. Your fh was better with forward motion. Your backhand looked good - both slice and topspin. Since you were playing with a less powerful player and he is your Dad, it seemed you relaxed and didn't hit the right shot many times. You will need to play a higher level player to see what level you are at. Your Dad is actually not a bad opponent to practice with sometimes. He is fairly consistent and doesn't make a lot of unforced errors. When he is stretched wide on shots he can barely reach, he often hits back a lob to try and get back to neutral. His court coverage and movement is limited, but not bad at all for someone 59 years old! He also has a decent slice and hit a really good dropshot at around 8 minutes into the video. With patience and improved consistency, you should be able to eventually beat him fairly easily, maybe 6-0 or 6-1. That's great you get to play your dad! HAHA...omg..pretty good. So good and unusual in this day in age that I completely missed it. I thought you meant "dad" in the context of your opponent's age and how you got crushed. But yeah, good one!!! hate to be blunt and break it to you but your serves and groundstrokes are not even good enough for 5.0. You could barely get a first serve in, and when you do it's not even that fast nor is it placed well. Your forehand either goes long or into the net, when it does go in then its short as hell there is not enough depth to even push your dad who looks like a 4.0 weekend hacker. Backhand is almost non existent so dont even get me started about your footwork, that's the worst part about your game and it's the one thing that sets apart the 5.0+ from the lower tier. take my advice and just forget about it man dont bother just play social tennis for fun. If my son takes an interest in tennis, I hope to play with him in the future. One thing you can try to do when playing against your dad, is try to be in position on EVERY SINGLE SHOT. Most of his shots are not super hard, so if you continue to improve your footwork, you'll eventually get to the point where you'll feel like you can dictate almost every point without missing. First id like to compliment your dad. 2nd you have nice strokes. The bad part is you hit way too many balls down the middle, a 6.0 will take control of pt and never let go off the first one (much less the serve). Your defense isnt great, has no accuracy. My biggest suggestion to you is to develop the inside out lefty fh, yours curves to the middle (early contact, hitting the back of the ball, instead of inside) , so you have no up the line threat. Winners are only straight lines. I do like your cross court, you get nice depth, but dont forget to roll a few so they have to move into the court, making them fall back on their next. After a while your best shots arent winners, gotta construct when you cant demolish. Typical ttw responses so far, gotta love this forum. BTW whens the fireftw match play video coming out?! Lol are we watching the same video? His footwork looks 5.0 at the moment and he's barely started playing again. How many 4.5s do you see sliding around hitting flick shots while facing away from the net? He plays a very unthodox game (29 inch racquet 130 sq in head), he started age 26 and went 6-1 in a 5.0 league when he was 40 (his prime). He claims he was faster than me at age 40 then I am now. Even now he has pretty good lateral movement, but weak forward movement. When I was in my “prime” I would routinely beat him 6 2 6 2 or worse. I am extremely lucky to have said opportunity and even more so that’s hes a formidable opponent even at age 59! The road towards an “impossible” goal is never straight, there will be many winding curves and even backwards routes along the way! From the sample video above I 100% agree with your feedback. Let me get some more conditioning and a few more matches in then we’ll rediscuss! I especially agree my footwork is poor, as I mentioned my conditioning is not there yet (just recently went from 188 lbs to 160 lbs), let me train my new muscles so I can regain control of my body. Thank you for your feedback! I need to re-condition my body so I can maintain solid footwork through the entirety of a match! You asked me that a few weeks ago and the answer is still the same. I will post the video when I judge that ive improved significantly in every area, and will be something completely on a whole new level from anything ive posted before, and people will be shocked how far ive come in such a short amount of tennis time. Its also going to be on hard court this time, thats for sure, because its my favorite and most natural surface to play on. He has alot of things to improve, but he also has a lot of very good things going on for him, and he is very young. If he is serious and passionate about improving and becoming the best he can, which from what ive seen so far he is, he will achieve great things in the future. Yeah, watched this on YT yesterday and kinda came away with the same conclusion. HOWEVER...some things to consider here, the biggest being your Dad isn't giving you consistency and pace that can challenge you so I think that was an issues off the bat. With that, to me it looks like you went for too much on too many shots instead of trying to groove on the pace that was given and work on placement. Overall, yeah...some work to do. As i said in the other thread though, let's see you play competitively in 4.5's first and then you might worry about getting to 5.0. Not bad to think and have a goal to reach 6.0, but expectation can cause more issues than it is worth, so play and improve where you are now and let the ratings happen as they should. Athletic peak is 27-28. Also, if you're not tall & powerful so therefore you need to be fast. Can't teach speed. As long as you have fun, that's the key. I believe you can make 4.5 again. If you ever make 5.0 I would be truly impressed which is a very high level. I cannot go along with your delusions of 6.0 though, you're not a child needing gold star stickers for your fridge...I hope. 3rd of all which relates to 2nd point, rec players are not even close to the PEAK of their potential, so they can improve a ton in terms of athleticism, some may even improve athleticism in 40s or 50s, unless we talk about a pro player from another sport that is near or at the PEAK of his athletic ability. 3rd pt: can't teach speed. 1st: generally speaking athletic peak is 27-28 for men. Do you think a 27 yr old 4.0, not tall and not too fast can become a competitive 6.0? Generally speaking, not really, it depends on what kind of athletic attribute we are talking, speed? strength? Agility? Different for everything and also different from person to person, some can peak at 23-25, some can peak as late as 29-31. No your missing the point.. say 100% is your athletic PEAK, your athletic potential lets say.. if your athletic peak potential is at 100% at the age of 27-28 like you said, and you are a pro athlete who is around that %, then you can't really go further and at one point you start declining. Now what if you are not even close to that number? Sure.. your peak potential might start to gradually slowly decrease at some point, but if you are only at 60% at this point, you can make massive improvements still, doesn't matter if your peak is now at 97%, you are still only at 60% at this point. Take a completely out of shape guy, doesn't even need to be fat but lets say hes fat, never played sports or anything, 53 years old, past his athletic peak and declining? Or is he? If this guy would start seriously training at this point, cleaning up his diet, going to the gym etc... he would make alot of strenght gains and improve his athleticism, speed, strenght etc... by alot, but hes 53 years old, yes, not nearly in his athletic peak, doesn't matter. How do you know how close to his athletic peak is the OP? He is not fat but is he really that in shape? Does he seriously train for speed, explosiveness and strenght in the gym? Does he have no more room to improve his squat weight? You don't know anything about that. 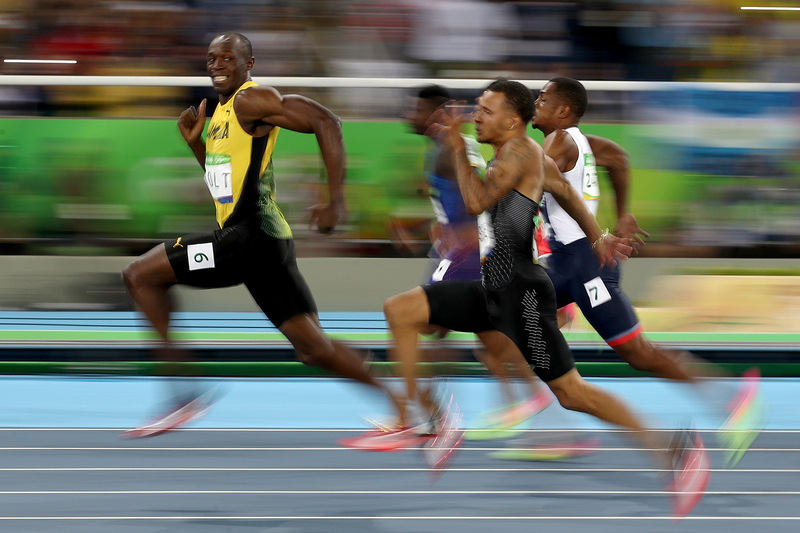 Usain Bolt set his 100m/200m world records at age of 23/24 and retired at 31. And Carl Lewis set his best 100m run at the age of 30. The more you argue the more proof I will present that its bs, different people are different. Also regarding Bolt, he did set his best time at 23/24, but you failed to mention the fact that he had quite alot of injuries after that and never quite recovered back to 100% like before. Theres a few reasons why top pro athletes peak so soon and then never set the best result anymore, but not ALL of them, as proven above, and there are many more cases. 1. Pro level training and volume of work is incredible hence many injuries start piling up, and injuries not only prevent the athlete from training optimally, simply put they worsen the athlete, its not quite the same, scar tissue and whatever else is left behind from the injury makes its toll, there are countless examples of fast explosive athletes picking up an injury, and then after they are never the same again. 4.After years and years of INSANE work loads and training that is required to be at the TOP peak performance, many pro players who now have a ton of money also simply lose the motivation to put 110% effort anymore to train insanely, and just let go a bit. Rec players have none of the above problems, so if some pro athletes can peak and have the best results even at 30 or 31, then rec players can have them even much later. Athletic ability is more than just raw speed. Balance is a very crucial part of athletic ability that often gets overlooked. Good speed combined with great anticipation and balance is better than just pure raw speed. As for OP and 6.0....it's his goal. Whether he can achieve it or not is anyone's guess. However, I certainly do know that he'll never achieve it if he doesn't even have the goal/dream of achieving it. So why tear that goal down? He's not tearing anyone else down for not having that goal or working towards that (unlike what TTPS used to do). Wishing him the best of luck. As for OP and 6.0....it's his goal. But the funny thing is he never said his goal is 6.0, he said his ultimate goal is to take a set once from a 6.0 player, but everyone in this thread not only took it as he said his goal is 6.0, they even comment that his strokes are nowhere near 6.0 or his movement or whatever, when he never even said 6.0 is his goal, yet alone that hes close to it lol. Seems to me like people just hating just for nothing. Let's agree that speed peak for males is somewhere 21-30, based on track and field pros (tennis pros also seem to follow this). That means he's towards the end of his peak speed window. Which means that as years progress his speed will be less and less of a weapon, and he'll need other technique/weapons to win matches (which to be honest he currently really doesn't have). Agreed, rec players (who work at it) peak later than pros. Many peak in their 40's. But this is not due to speed being their main weapon. Jolly had a statement a while back that D1 players peak in their early 20's and then quickly decline, whereas rec players (non-college) can slowly improve until their mid-40's. As a YouTuber, ive learned that any attention/comments positive/negative are good, the YT algorithm does not differentiate people who love you or hate you, just people who watch your channel and comment. Yup, one step at a time first as I work towards my end goal. And my dad does have a very unorthodox game, mixes up pace/spin + serve/volley, players at his level who play him for the first time usually have nightmares. I agree, if my athletic capacity is currently still at 100, then I would estimate I’ve achieved about 30/100. YES!!! Great post, anticipation and balance are so crucial! I went to high school with a guy who currently plays wide receiver and running back for the ravens. He was the only person who could beat me in a sprint but I could still beat him about 1/5 times if I got a great start. HOWEVER, his agility and balance were leagues ahead and if we tried any other contest besides a straight sprint, I’d get smoked. @IowaGuy I mostly agree with many things you said, my point is just that none of us know what kind of talent the OP has in terms of how far he can push his tennis level, thats almost impossible to gauge and can only be seen in practice after many many years of hard work, practice, matchplay, fitness work and really hard work in order to maximize and reach his tennis potential. Some of these posters here however just came in the thread and started laughing that he will never reach his goal and he better just quit, when they don't know that for sure, yes maybe they think and are almost certain of it, but they don't know for sure and theres no need to joke and ridicule someone about it, someone who is obviously very passionate and driven, and then someone comes and wants to destroy that drive and passion and kick them to the ground, whats the point in that? No wonder we rarely get any videos from posters here, and many who do post a video or two end up not posting anymore after. I was never that fast but boy could I do 12 ounce curls! I agree, and would never advocate that someone quit trying to improve. I tried to give OP some suggestions on his serve. But, I do think it's good to be realistic about one's goals when starting around 4.0, so as not to get disappointed in 6 months when you're not taking a set off a 5.0, let alone a 6.0. 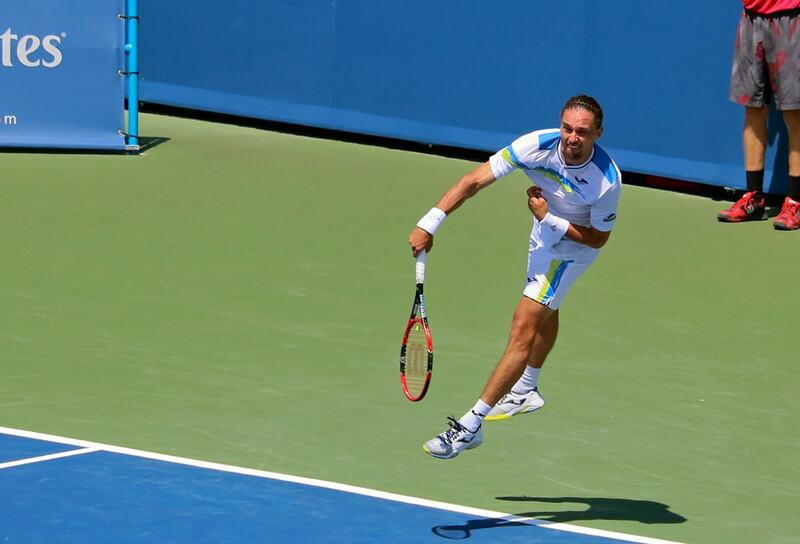 @TennisProdigy I consider myself as fast for my age. However, if you were winning 1/5 Sprints with a guy currently playing WR/RB in the NFL, you're in a whole different league when it comes to speed. So once your game shape gets better, you have something as a base towards getting to a high level, that a lot of folks here don't. All the best. im talking about footwork not his speed or movement, you can be crazy athletic and move lightning fast but that doesnt mean you have the correct or good footwork which OP lacks. his current footwork is not even good enough against his old man who looks like a 3.4-4.0 level player, so against a good 5.0 player he'd get creamed, all he will be doing is diving and lounging left and right frantically trying to get the ball back into play. nah im just a realist and tell it as I see. if OP said he's striving to be a 4.5-5.0 then that's realistic and it's an attainable goal if he puts in the work but to beat a 6.0 that's just a dream is what it is. if you say it like that then almost everyone has that potential with many years of hard work and practice, what makes OP any more special? but you gotta be realistic about it, to reach the level that OP is dreaming of it takes alot more than just practice and hard work. Not saying it cant be done unless you have all the time and money in the world. Why would anyone have the potential? Do you think 10 random people assuming the all work for 5 years or 10 years or whatever, extremely hard, alot of tennis, same teaching, same school, same general work and everything, that they would end up at the same level? Theres alot of difference between players, some have alot of talent in terms of feel for the ball, shotmaking, some have really good eye hand coordination naturaly, some have extremely good athleticism, some really good natural reading of the game and smarts and problem solving, some are extremely tough mentaly or have great coordination and balance or a natural fluid feel for a throwing motion etc etc... then others who are not particularly good in any of these categories. You can improve anything but some things improve slower and some faster, but more importantly some people pick up things faster and learn faster, and also some people have naturaly better predispositions for certain things or sports..
To reach 6.0 or lets say UTR13 requires ALOT of TALENT and great tennis predispositions, there are many many players who start at the age of 4-7 and train for 15 or 20 years that never reach that level or anywhere close to it, simply because they are not talented enough, not good enough coordination, not good enough athleticism, not good enough hand eye coordination and many other things. My coach has alot of experience with training people, mostly kids and juniors but also some older ones, and theres a big difference player to player, even if everything else is almost relatively the same, some just are more natural and more talented and improve much faster. There was a junior girl who was 15 and now 17 and another one who was 17 and now 19, the 2nd was quite alot better at 17 than the first at 15 mostly due to age and physique advantage, and she also has rich parents and trains more but more importantly has the same training more or less since the coach is the same, and also tournaments and everything else, and has more money for proper nutrition, equipment etc etc... but the 1st girl simply is more talented, the coach and a few others saw it from the start, now at 17 and 19, the 1st girl already is better than the 2nd girl and beats her. The 2nd girl even was a bit arrogant 2 years ago, that the other girl is no competition for her, and for her she seems weak, must be punching her face now, wonder how st*pid she feels now.